Knocknagantee is a high perch which looks out over Sneem to the Beara Peninsula and the Caha Mountains. 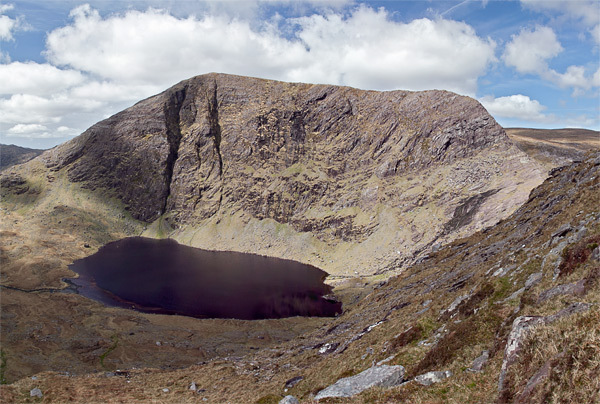 The hill is particularly impressive to the east, where it looms over the peaceful Eagle's Lough. 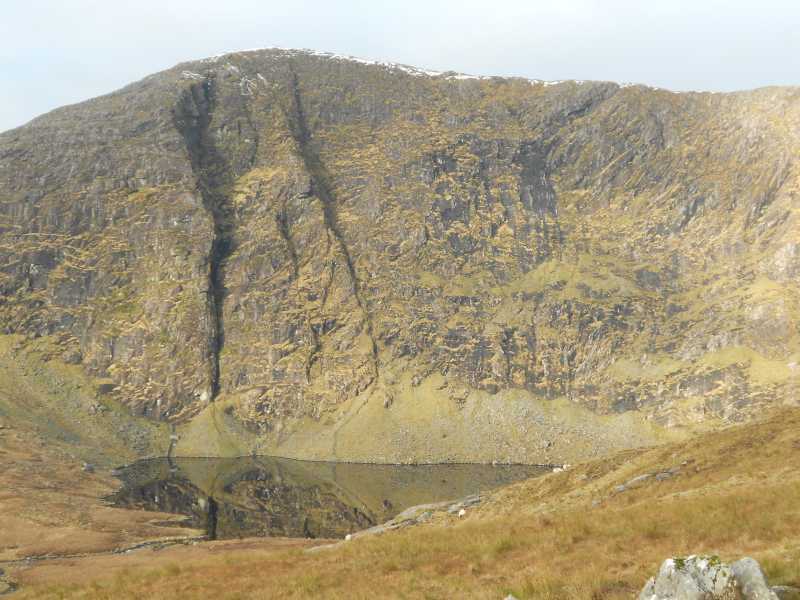 The hill is most usually approached from the south; the typical starting points is from a farm at Gloragh, V669712 A, use can be made of a farm road leading to the west of the summit and to an altitude of around 500m, from where the summit is a steep but short climb. Around an hour and a half should see you to the top. Knocknagantee can be reached as part of a circuit of Coomavoher or as described by csd. 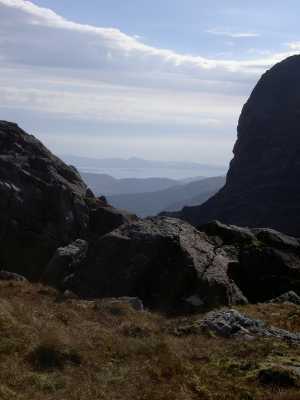 The end of a track is shown to the left of a white post in the foreground of the picture which was taken from SW of the summit. This track can be reached from roads to the east. 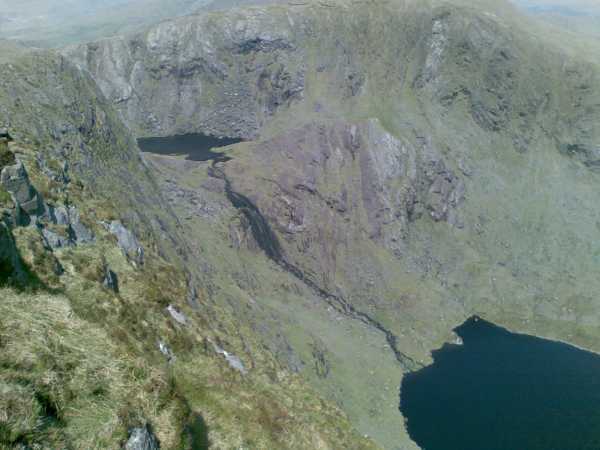 Picture from simon3 : Dramatic eastern cliffs over Eagles Lough. 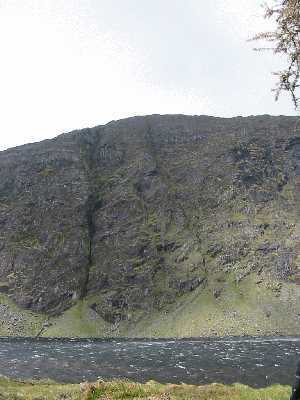 Picture: Dramatic eastern cliffs over Eagles Lough. Bedposts of the boggy bower. Knocknagantee and Coomnacronia are two of the bedposts of the sagging mattress which is the upland bounded by them, Knockmoyle and Coomura to the north. A wild, remote spot made more difficult by a number of barbed wire fences. One place to get a fine view of the cliffs of Knocknagantee is from the steep ground SW of Coomnacronia which is about 1km to the east, over Eagles Lough. Unusually the bigger cliffs of Knocknagantee, some 350m high, face east or south-east which you can see extending right from the top in the picture.